Somehow, plans to improve access to clean options that help each of us avoid contributing to traffic and climate change have been the first to lose out in city investment. How can the Durkan administration get back on track? Deciding how we will get around town is the most important environmental choice Seattleites make each day. Transportation by vehicles is the leading source of Seattle’s contribution to climate change, accounting for two-thirds of our greenhouse-gas emissions. Meaningful progress on climate change requires making it easier, safer and more affordable for people to walk, ride a bike or take transit. While Seattle has made some progress on those climate-friendly options, we have a long way to go to become an emissions-free city, the goal the city set for itself in the 2013 Climate Action Plan. Mayor Jenny Durkan’s recent update to the Climate Action Plan calls for “bold solutions that reduce pollution” and a “fundamental reshaping of our transportation system,” for a fossil-fuel-free future. Those sentiments are welcome, as are recent proposals to extend free ORCA cards to all high-schoolers, study congestion pricing downtown and build a protected bike lane from downtown to Capitol Hill by 2019. Andrew Kidde is transportation chair for 350 Seattle, a nonprofit climate-action group. Gordon Padelford is executive director of Seattle Neighborhood Greenways, a walking and biking advocacy group. Rebecca Monteleone is chair of Sierra Club Seattle Group. • Weakening plans to improve the speed and reliability of transit on Third Avenue by not expanding its operational hours. 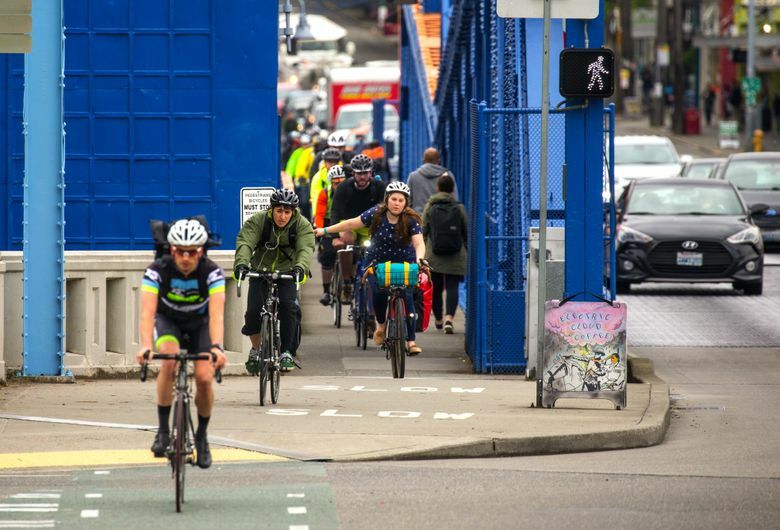 • Delaying the completion of the Basic Bike Network, a system of connected, safe and comfortable downtown bike routes that would double the number of people biking, according to the city’s own analysis. • Backpedaling on commitments to build 250 blocks of sidewalks and other promised transportation improvements in the $930 million Move Seattle levy. • Releasing a new Climate Action Plan that focuses almost exclusively on electric cars as a silver bullet for solving our transportation-related pollution. Somehow, plans to improve access to clean options that help each of us avoid contributing to traffic and climate change have been the first to lose out. How can the Durkan administration get back on track? First, electric cars are an important component of achieving the region’s climate goals, but in a growing city, a traffic jam of clean cars is still a traffic jam. Building a transportation system that gives us more choice, keeps us safer, saves us money and reduces climate pollution requires a holistic approach. Second, we need to deliver on long-planned projects that would give people viable options to get around. We need to get buses out of traffic by extending the bus-only hours of operation on Third Avenue and elsewhere. We need to build the Basic Bike Network to give people routes that connect to where they need to go (Vancouver did this and saw ridership grow 60 percent). And we need to build the 250 blocks of sidewalks that the Move Seattle Levy promised — and more — so that a senior walking to a grocery store and kids heading to school can do so safely. We understand the need to adapt the Move Seattle levy to account for today’s escalating costs. We can do this, not by scrapping our vision, but by finding efficient ways to deliver projects. For example, using city of Seattle construction crews instead of contractors would significantly cut costs. Also, we can explore supplementing existing funds with additional sources of revenue, such as impact fees on developers. But even solid plans and funding are no guarantee of success if every transportation project is subject to the political winds of the day. So, lastly and most critically, we need leadership that rises above the inevitable resistance to change and holds to the higher vision that Seattle has embraced time and again. The city’s rapid pace of growth presents huge challenges for our transportation network. But if we rise to those challenges rather than shrink from them, this can be the moment in history when we finally turn the corner on delivering the transportation choices the people of Seattle have been asking for. Rebecca Monteleone is chair of the Sierra Club Seattle Group.